The article deals with the effects of improved methods of training 7–12 year old children at the initial stage of long-term training using specialized Judo Games. Modern methods of training in many sports, Judo in particular, are characterized by early specialization. In this regard there could be observed immaturity of some existing training programs when age-related features of beginners are not taken into consideration, and as a result children’s health is suffering unfortunate consequences. Methods of initial Judo training open vast space for perfection and development of this kind of sports. The author initiated and practiced teaching and training process at the IT (initial training) stage Judo beginners by using Judo games as means of full development of physical features and shaping combat skills. This experiment proved to be actual and practically valuable. 1. Bompa T. Periodization Training for sports. Champaign, IL: Human Kinetics. 1999; 259. 2. Deshle S.A., Cherniyaev V.V. Development of dexterity of primary schoolchildren. Physical culture at School. 1982; 8. 3. Eganov A.V Methods of elementary education in judo: a textbook for coaches working with beginner judokas. Ural State. Univ Phys. culture. Chelyabinsk: [nc]. 2008. 283. 4. Geller Ye.M., Rudnitskiy V.I., Raspopov S.N. Social pedagogical functions of games in training of young wrestlers. Abstract from VI Scientific conference. Tallinn.1980; 69–70. 5. Ivanov M.A. 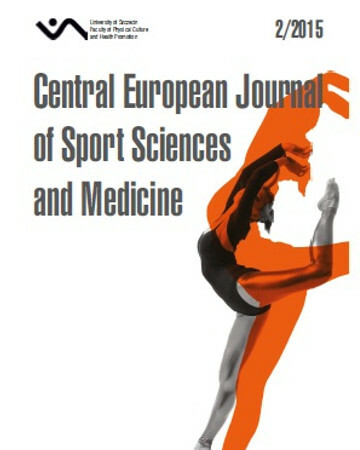 Game method as a factor of increased effectiveness of special training of young female gymnasts. Author’s abstract. Dis. cand. ped. sci. М. 1984; 14. 6. Jagello W. Wydolnosc fizyczna ogolna mlodych judokow na tle rozwoju somatycznego. Roczniki Naukowe AWF Warszawa 2000 t. ХХХIХ: 91–112. 7. Ketelhut R. Judo for children. Engaging manual for girls and boys. Transl. from Germ. М. Терра-Спорт. 2003. 8. Konovalova I.A. Effectiveness of the game method in training of groups of young swimmers. Author’s abstract. Dis. cand. ped. sci. М. 1990; 22. 9. Korovin S.S. Using special sports games in sports training of young gymnasts. Cheliabinsk. 1983; 84. 10. Krepchuk I.I. Complemented impact of action-oriented games on physical qualities and combat skills of young wrestlers at the initial stage of training. Author’s abstract. Dis. cand. ped. sci. Мinsk. 1987; 214. 11. Rybalko V.M., Krepchuk I.I., Geller Ye.M. Classification of specialized game methods in sports wrestling. 1986; 1: 10–12. 12. Stankiavichus L.A. Effectiveness of action-oriented games in cultivating of movement qualities of primary schoolchildren at physical culture lessons. Author’s abstract. Dis. cand. ped. sci. Кyiv. 1983; 23. 13. Vilenskiy Yu.M., Dubovis M.S. Games in sports wrestling. Kyiv, Zdorov’ya. 1977; 87. 14. Volkov L.V. Theory and methods of child and youth sports. Kiev. Olympic Literature. 2002; 294.